Readers may recall that in October 2012, I blogged about the 50th Anniversary of Hanna-Barbera cartoon "The Jetsons" (catch my post on that by visiting http://goo.gl/01mqj). It was a sort of a tongue-in-cheek intro that the future had just received its membership card from AARP, but the reality is that at least in my lifetime, many of the gee-whiz things we saw in "The Jetsons" have become facts of life. True, we're not flying to work yet, but many other things are now pretty ordinary. One technology that I highlighted was the concept of video telephone calls. These days, that technology, whether its via Tango, the far more ubiquitous technology from Skype, or Apple's proprietary (and non-compatible) Facetime apps on Apple's iOS devices, or Google's Duo app (available on Android and iOS platforms) today, video phone calls are no longer far-fetched dreams of visionaries. But it wasn't always that way, and the change has actually been quite recent. According to the AT&T Archive, the American public first witnessed what was dubbed the Picturephone at the 1964 World's Fair in Queens, NY. Soon thereafter, what was then known as the Bell System (which was in reality known as AT&T) rolled out three Picturephone booths in Washington DC, New York, and Chicago. Those three Picturephones could communicate only with each other. Usage costs ranged from $16 to $27 for just three minutes (that's $118 to $200 in 2012 dollars!). The old Bell System even published a futuristic-looking brochure (now scanned into Adobe Acrobat format) which can be found by visiting http://bit.ly/2eplcjD tempting us that the Bell System was working to bring those video phone calls to our homes in the future. As it turns out, that did happen, and the old Bell System disintegrated following antitrust regulators suing (and winning) a lawsuit to break the monopolistic company up. The company we know of as AT&T in 2013 is actually one of the so-called "Baby Bells" which grew into a company that looks a bit like the old Bell System used to, minus the legendary Bell Laboratories which invented the fiber optic technology which runs much of today's internet and lots of other stuff, minus Western Electric, the company that manufactured all those telephones that still sit in many people's homes even today (side note: if you can find a landline phone made half as well as those were, you might consider holding onto it, because the cheap junky phones sold today aren't likely to work for very long after they are removed from the packaging; I've bought three which didn't even work after I opened the plastic). In the following video, which is courtesy of the AT&T Archive (noted above), shows a short video (originally from film) from 1970 containing actual footage from the inaugural Picturephone call at the launch of commercial service in the first test (beta) city, Pittsburgh. The call was made from then-Mayor Pete Flaherty, in Pittsburgh's Bell Telephone HQ auditorium, to John Harper, then the Chairman of Alcoa. Those two men made the call from locations that were actually only a block apart, but seeing them on a screen in realtime seemed like an incredible vision of the future. The AT&T Archive also has some interesting information on why the original Picturephone service never quite took off (the reason wasn't technological, but cost). It seems that companies, who were seen as the target market for the service, balked at paying the equivalent of almost $1,000 per month for the video conferencing service (which came with a minimum of 30 minutes. Additional sets on the same line added another $50/month in 1970 dollars; additional minutes were priced at $0.25 each, again in 1970 dollars). Still, when viewed from its historical perspective, you can see just how visionary all of that was in 1970! 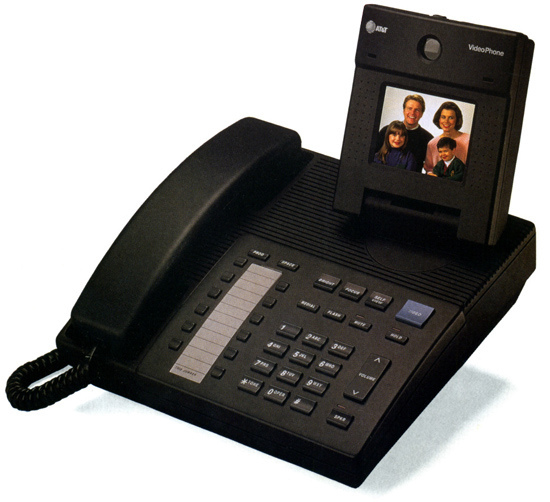 In 1992 (until around 1995), AT&T tried again, with its VideoPhone 2500 to the general public, with prices starting at $1,500. Unlike earlier efforts, this particular device was designed to provide color video using ordinary Plain Old Telephone Service (POTS), rather than broadband connections. As it turned out, AT&T would ultimately by acquired by a baby bell (the company behind the acquisition was SBC, the Southwestern Bell spinoff which went on an buying binge, snapping up most of its baby bell rivals except Bell Atlantic (Verizon as of 2013). From a tech standpoint, VideoPhone 2500 was a winner, but in spite of the superior technology behind it, cost was the key issue in its failure. However, AT&T's published research helped pave the way for other companies to later enter the field of videoconferencing. These days, a LOT of people complain that Apple's Facetime is limited only to other iOS users, and that's a major drawback, whereas Google Duo operates on both platforms (though Google got into the game late). That means you cannot Facetime your grandmother if you've got an iPhone but she's got a Droid. Rather than encouraging Apple device sales, it seems to be doing the opposite. There's been a steady stream of news that Apple has lost its perch on top of the mobile device market as Samsung outsold it (see http://n.pr/16KAXED for details). iOS is a nice operating system, but Wall Street is looking for Apple to sell cheaper devices to get them into more people's hands, especially in the developing world. Apple is sitting on a very big hoard of cash at the moment, so the company is hardly in imminent danger, but the many experts believe the company's premium-priced strategy may need retooling. Still, to get around that proprietary Apple technology hurdle (lets face it, of mobile devices, recent data shows that 60% of all devices now in circulation are powered by Google's Android operating system, Apple only has about 40%, down from half a few years ago), Skype already has apps that work on both, as does Google's Duo and there are rival apps like Tango which do the same. The point is these days, its not technological hurdles but marketing hurdles, but most people already have the technology to do video conferencing right from their mobile handsets. But we should remember it wasn't so long ago all of those were just visions of a future world!